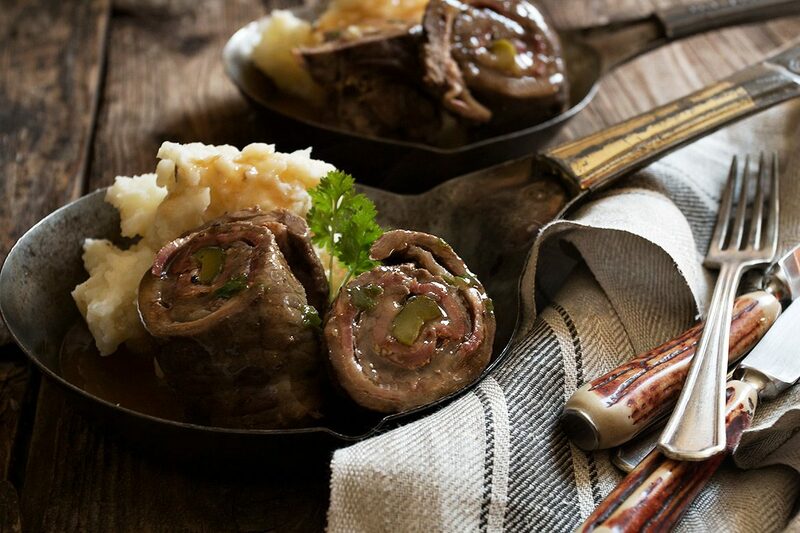 This traditional German Beef Rouladen is wonderful comfort food and perfect for an Oktoberfest. Rouladen is simply tender steak, seasoned with mustard, onion and paprika and wrapped around a pickle, served with a lovely pan gravy. So when I was asked by the lovely Milena of Craft Beering if I might like to cook up something for a virtual Oktoberfest celebration, I was definitely in. I thought about cooking up a traditional German dish and rouladen came to mind. You may not be familiar with rouladen, but you will certainly love the flavours of this wonderful, comfort food dish. It’s meat and potatoes, in German form. With a pickle in the middle! While Rouladen is a traditional German dish, there are as many different versions as their are German Omas. I’ve detailed some of the options in the recipe below. This is the version I love, with grainy mustard, a bit of paprika, lots of bacon (to keep it moist! ), a bit of chopped onion and a pickle in the middle. If you are lucky, you will find “rouladen” cut beef at your grocery store or butcher. Of course, when I went looking for it, there was none to be found. It’s quite easy to find very thin round steaks though, so that’s what I went with. You can serve your rouladen and gravy with mashed potatoes, German potato dumplings or spaetzle. We enjoy mashed, flavoured with a little sour cream. On the side, cooked red cabbage is very traditional. 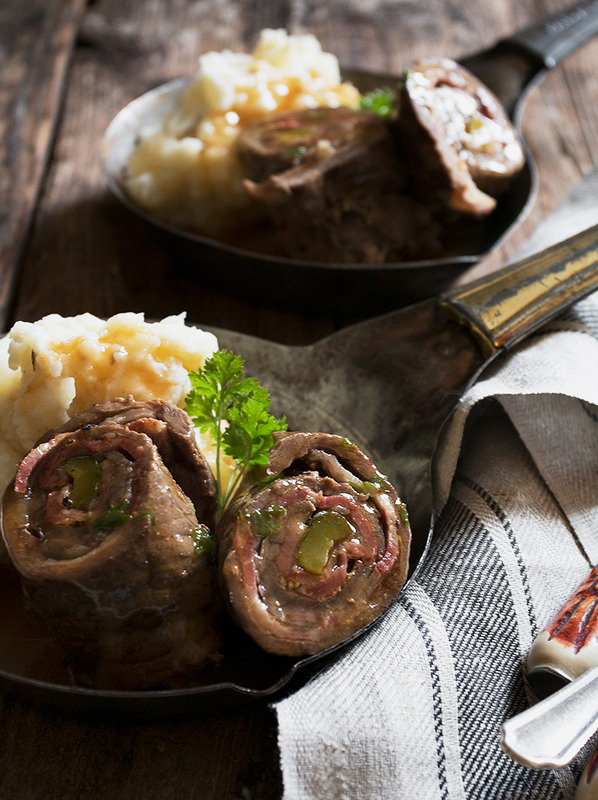 Traditional German beef rouladen is beef rolled with bacon, onion, mustard and a pickle, served with a lovely pan gravy. 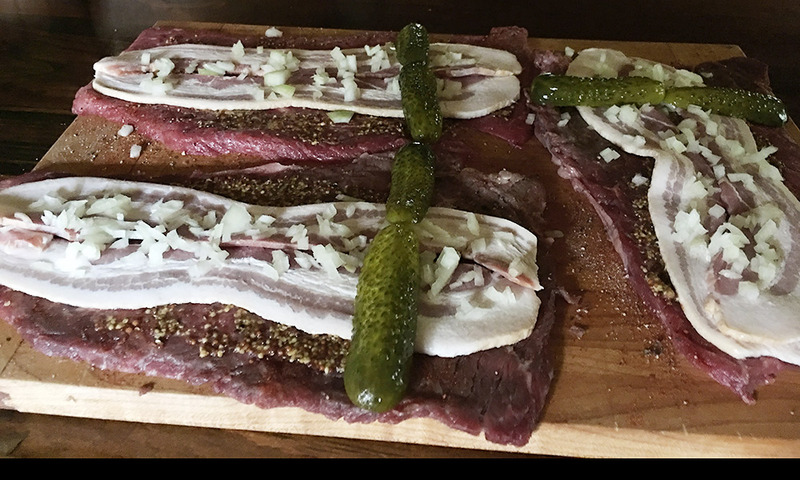 Prepare the rouladen by pounding out the beef until they are 1/4 inch thin and about 5 inches wide by 9 inches long. Sprinkle with salt, pepper and a sprinkling of paprika. Spread 1 Tbsp of whole grain mustard over each of the 4 pieces of beef. Place two pieces of bacon over each piece of beef, side by side, trimming any part of the bacon that extend over the ends. Scatter each with diced onion, dividing evenly between the four pieces. With the widest end of the short side facing you, place two pickle halves end to end about 1 1/2 inches from the end. It's ok if they stick out the side at this point. Take the end closest to you and fold it up and over the pickles. Continue rolling by lifting and rolling until it is completely rolled. Take a skewer and secure the end of the roll to the main part of the roll, so it doesn't unroll. Trim any excess pickle sticking out the sides so it is even with the sides of the roll. Roll up the remaining beef pieces similarly. Cook, covered in the oven until tender, about 1 - 1/2 hours (depending on the size of your rolls), flipping rolls over a couple of times during the cooking period. Made exactly as written. Absolutely delicious!! Looking forward to trying other recipes from your site!! So glad you enjoyed it, Denise :) Thanks! 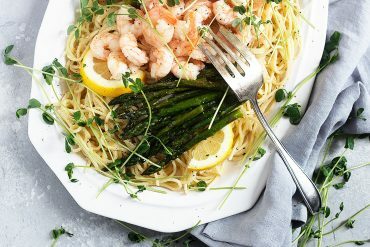 This recipe worked very well for me, having tried a few. I did however at the recommendation of a German friend for whom I was cooking, reduce the tomato paste slightly and add a little cream to the gravy using flour to thicken instead of corn starch. I will try that next time :) Thanks! Hi JM, I think you could just skip the bacon and still have a nice dish. One quickie version I know of used a chicken stuffing mix with the pickle and onion, so this might substitute for the bacon. Hi Kate and yes, it would be a good substitute for the bacon, for sure. Do enjoy this. I spent a few years in Kitchener myself, so sampled many a great German dish, too! I also omitted the bacon & made a mushroom stuffing which was simply delicious as well. So glad you enjoyed it, Dianne :) Thanks! I made the German Beef Rouladen for Christmas Day dinner and it was amazing. The meat was so tender you could cut it with a fork and the gravy was very tasty on mashed potatoes. I will certainly be making this recipe again very soon. I went to a local German butcher shop who sliced the rouladen beef into the right size needed for rolling. Thanks again for sharing your recipe. Just delicious! We made it for our family Oktoberfest meal. 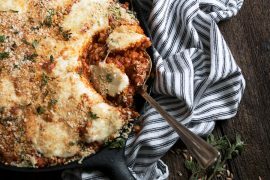 So simple – such comfort food. We all loved it and I already have requests to make it again! The pickle was such a fun surprise! Thanks. Superb!! I have been making the same recipe for over thirty years but decided to give your post a try. We absolutely loved your recipe. The gravy is so flavourful. 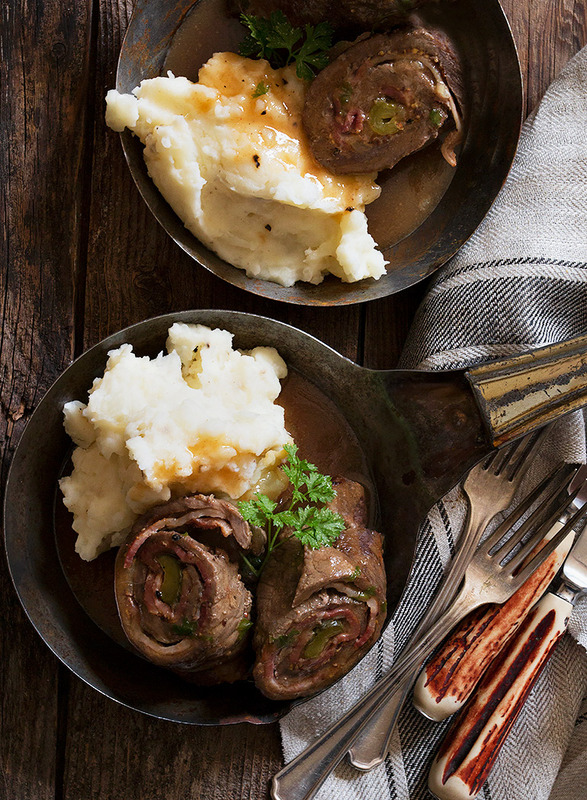 Definitely our new go to recipe for rouladen. We served it with red cabbage and parmesan smashed potatoes. So glad to hear, Elizabeth :) Sounds just perfect with the cabbage and smashed potatoes! Thanks for coming back to let me know. Your Rouladen sounded so appetising that I just couldn’t wait to make it. I didn’t have a bit of beef in the house but I did have chicken (unhappily breasts) but one has to go with what you have. So I split and bashed them and went ahead with your ‘add ins’ but didn’t cook them for so long. The sauce was a delight of which I have a little leftover which will make an appearance in some other way soonish. This dish got the ‘thumbs up’ all round. Really lovely Jennifer and I will make it with beef next time. THANKS!! I just made last night for my dinner . Very simple and interesting for me. Gravy sauce with Cornstarch that amount was too much , so I did cut half. Thank you so much as always. I just want to left my opinion about my cooking result. This is by far the best looking German Beef Rouladen I’ve ever seen! Your university years sound fun too! this looks amazing! I love how creative everyone got with their recipes! i rarely cook with beef, especially in this way so really need to branch out and try this! looks stunning! Cannot, cannot wait to try this! Never heard of it as there is no German anything happening where I live but the pickle…it hooked me. Looks superb, love it! Thanks for sharing. This is a really fun post for me as I grew up in a little part of Wisconsin where almost everyone has German heritage. Beef Rouladen was a such a familiar dinner. Yours looks so tender and delicious! Sounds like Oktoberfest at your University was the place to be!! Too bad I can’t rewind the clock and pay you a visit back then! ;) Guess I’ll just have to make this gorgeous Beef Rouladen, grab a few pints and celebrate Oktoberfest at home. This looks beyond delicious, Jennifer!! I’m seriously drooling! Cheers! Wow! This looks like one delicious German dish Jennifer. Tom and I are huge German food fans, so I’ll need to try this recipe! This looks just heavenly! I love that pickle in the middle :). Perfect Oktoberfest food! Prost! Thanks so much, Kelsie :) Prost! Oh my! I wish I had been your friend during your university years! And the Oma whose version of Rouladen you have perfect deserves special gratitude:) These are absolutely tempting, and with the individual pans – beautifully presented! Prost Jennifer! Thanks so much, Milena and thanks so much for organizing this fun food event! Love all the goodies everyone made and will work my way through them over the next couple of weeks! Thanks so much, Sue and yes, the gravy needs something acidic, for sure. I went with wine, but vinegar works great, too! We were lucky we got to try them made by a German friend! Absolutely delicious! Yours look as amazing, moist, tender, and succulent. What a great collection of recipes in this Oktoberfest bash!! My mouth is watering in the biggest way! Such a lovely dinner to celebrate Oktoberfest!! oh, and it’s often served with cooked red cabbage on the side which is just amazing with the rouladen. You are very right! I must add that to my Cook’s Notes :) Thanks! Wow! when my favorite food blog makes my favorite meal from my German childhood. Given my success rate with your recipes, I can’t wait to try this. THANK YOU! Thanks so much, Kelly :) It’s definitely worth trying. 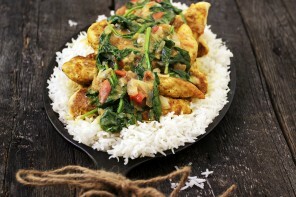 Great comfort food! LOVE that pickle in the middle. 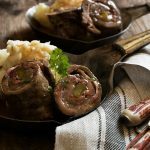 I’ve never tried Rouladen and now I can’t imagine life without it! Thanks so much, Cathy :) The pickle is fun and the tangy flavour works incredibly well! 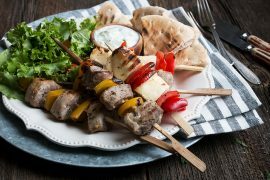 Great meat and potatoes comfort food. Thanks so much, Dawn and yes, the pickle really works!